The world is full of sunglasses, and it isn’t difficult to pick up a cheap pair from the local store if you need some shade on a sunny day. But if you want to dress up your look and make a style statement, a bargain-bin pair of sunglasses just won’t cut it. Instead, you need a pair of designer sunglasses, but if you are not convinced of the merits of designer shades and you need a good reason to spend the extra cash, here are five reasons why you are definitely worth it. Cheap sunglasses are two a penny and nobody will look at you twice when wearing them. If you want to stand out, you really need to be rocking a pair of cool designer shades from a well-known brand such as Chanel, Ray Ban or Oakley. And if you want to really stand out, wear a pair of oversized frames and pretend you are a celebrity trying to go incognito. 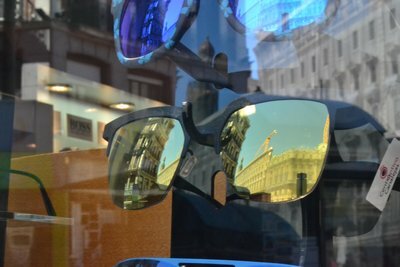 One of the advantages of buying designer sunglasses is that they come in different colours, so you can pick from a range of coloured lenses to suit your needs. For example, if you love skiing or cycling, a pair of yellow lenses will be a smart choice. Dark lenses are fine, but choice is always better and with designer sunglasses, you always have a better choice. The biggest problem with cheaper sunglasses is that they offer less protection from harmful UV light. Really cheap sunglasses do nothing to protect your eyes and you may as well not bother wearing any sunglasses at all. More expensive designer brands typically offer a UV protection rating of 400 or more, which is what you need to prevent serious eye damage. Cheap sunglasses invariably break within a few weeks. They are made of cheap materials and the first time you drop the frame, it will crack and the lenses will probably fall out. Designer sunglasses are made from durable materials and come with scratch resistant lenses. Obviously you do still need to look after your sunglasses, but at least they won’t snap the first time you pull them on. This is even more applicable if you wear sports sunglasses for running, cycling, skiing or any other outdoor pursuit. Cheap sports sunglasses won’t come with polarised lenses, which you will need to protect your eyes from the glare on a sunny day. Wearing designer sunglasses gives you extra kudos with your friends. People tend to notice designer frames and are more likely to compliment you on your outfit if you accessorise with a pair of Prada sunglasses or similar. Designer sunglasses are also a great conversation starter if you buy a style straight off the catwalk. You don’t need to spend a fortune on designer sunglasses. It is really easy to pick up cheap designer sunglasses from online retailers, but make sure you shop in a reputable online store such as Red Hot Sunglasses, or you could end up with a pair of fake sunnies instead. Brought to you by our friends at redhotsunglasses.co.uk.